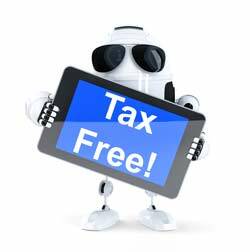 What is my Tax Free Allowance? The following tax article looks at tax free allowances over the past few decades and compares the higher rate threshold and allowances against inflation with a view to explaining how tax allowances have changed and been affected by economic flux. How much you earn. If you earn in excess of £100,000.00, your personal allowance will be reduced by £1.00 for every £2.00 earned over £100,000.00 until your personal allowance reaches zero. Your age. Certain age groups are protected by previous tax laws and conditions. Your situation. If you are blind you are entitled to an increase in your personal allowance via Blind Person's Allowance. Blind Person's Allowance figures change with each budget. You can review current and historical Personal allowance figures here. The graph below illustrates how the amount of personal allowance has changed. This graph is based on an individual earning 40k per year and includes PAYE tax payments only. The amount of Personal Allowance has steadily increased over the past 15 years to more than double the amount of Personal Allowance 10 years ago. That's excellent news for workers. The figure for the higher rate threshold (the point at which you start to pay 40% tax rather than 20% tax) consistently rose during the labour government. The net impact when coupled with the increase in personal allowance was that the average worker was paying less tax (in 2009, an individual earning 40k per year paid over 2k less tax per year than in 1999, have almost an extra £175 per month in their pocket). Since coming into power in 2009, the Conservative Government have continued to increase Personal Allowance but have consistently reduced the Higher Rate Threshold. The net impact is that our example worker earning 40k is starting to pay more tax at the Higher Tax Rate of 40%. At the low point in 2009, our example worker was paying circa £7225 per year in tax, in 2014 they are paying nearly £500 more (circa £45 per calendar month). So, what does it all mean. iCalculator is apolitical, we have no interest in a political party and the figures above are not indicative of one party being better than another or having more of a vested interest in individual workers. We must remember that during the labour term we had a boom, t was easier to spend money and be flamboyant, the conservatives have had to balance austerity in their figures. So, forget the parties, this is what you need to understand about Personal Allowances and its relationship to the Higher Rate Tax threshold. The higher the Personal Allowance, the more you can earn before being taxed. The lower the Higher Rate Tax threshold, the sooner you will have to pay tax at 40%. Cost of living increases and salary increases mean that we are all slowly earning more, the average person is getting closer and closer if not exceeding the Higher Rate Threshold. The rates of Personal Allowance, The Higher Rate Tax Threshold are not married to The Annual Inflation Rate (AIR). Let's look at what the figures would look like from 2009 onwards in they were. The Graph below illustrates how Personal Allowance and the Higher Rate Tax threshold would look if they were linked to the annual Inflation Rate. By linking to the annual Inflation Rate our example worker on 40k a year would have paid more tax during the 'good times' and less tax now during periods of austerity. There are many good arguments for 'paying your way' during the good times to make the tough times easier to manage. Clearly this is just a snapshot and there are also good arguments for manually setting Personal Allowance and the Upper Tax Threshold but we trust this provides food for thought. If you found the comparative affect of inflation interesting you may wish to use our inflation calculator which allows you to calculate the comparative historical salary to your current earnings. In summary, your Personal Allowance (Tax Free Allowance) is the amount of income you can receive each year without having to pay tax on it. Depending on your circumstances, you may also be able to claim certain other allowances. The amount of Tax Free Allowance varies between individuals and is based on specific circumstance and criteria such as Age and the Total Income (Gross Pay, money from savings and Pensions etc. before Tax has been deducted) for the Tax Year.